Embroidery turns ordinary clothing and accessories into unique and beautiful pieces. Machine embroidery can be very quick and easy to do. 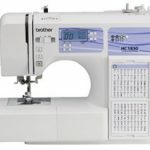 Let’s take a look at these two computerized sewing and embroidery machines from Brother to see which one will be the best for you. The Brother LB6800PRW is one of Brother’s most popular machines under a new model name. It now comes with a big new accessory—a rolling case. 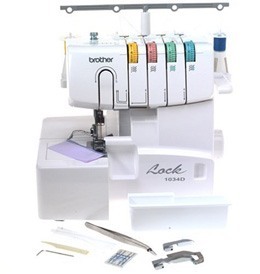 If you’ve heard of the Brother SESE400, you’ll see that this new machine is offering the same great features. 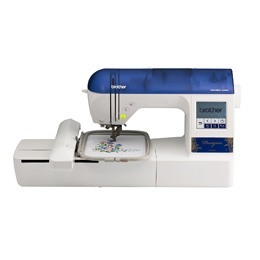 The LB6800PRW makes it so you don’t have to choose between sewing and embroidering. It can handle both functions well. 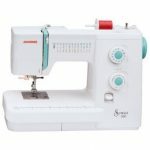 In fact, it’s almost like a serger, too, because it has a side cutter stitch that trims fabric along a seam to make a finished edge. There are 67 stitches total, including ten styles of buttonholes. The LB6800PRW makes buttonholes with just one step to save you time and effort. Plus, it comes ready to perform an assortment of basic, quilting, decorative, and heirloom stitches. Many of the stitches can be mirrored and their sizes adjusted up to 5mm long and 7mm wide. The 70 built-in embroidery patterns range from flowers and animals to lettering fonts. With the built-in USB port, you can download new patterns through your computer at home. 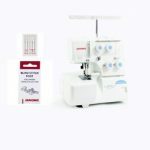 The LB6800PRW comes with eight snap-on presser feet like the embroidery foot, blind stitch, monogram, overcast, zipper, buttonhole, and zigzag general purpose. You can remove the extension table and do free arm sewing on cuffs. Then replace the table for quilting and embroidery. You can sew with one or two needles at once and work at up to 710 stitches per minute. The 7-point feed dog system keeps your fabric layers moving through smoothly. You can also drop the feed dogs to sew crushable fabrics like velvet. 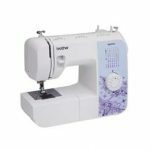 Other very convenient features include an automatic threader and bobbin winder, bobbin and upper thread sensors, push-button thread cutter, and start/stop button with speed control slider. The Brother DZ820E is a dedicated embroidery machine unlike the LB6800PRW. But it has a larger working space so you can sew larger projects up to 5 by 7 inches in size. It comes ready to use with 136 designs, 6 lettering fonts, and 120 frame patterns. The included CD contains 200 more designs plus you can download more from iBroidery.com. The onboard memory saves the patterns you create with the on-screen editor. The backlit LCD touchscreen will show you tutorials and let you rotate, mirror image, and resize the design you select. You can preview the results before you sew it. 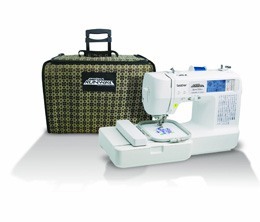 Once you’re ready to sew, the DZ820E has an automatic needle threader and a quick-set bobbin. The upper and lower thread sensors will warn you if your thread breaks or is getting low. And when you finish, the automatic thread cutter will snip your project loose for you. 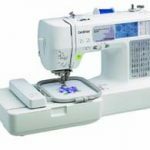 If you’re serious about machine embroidery, the Brother Designio DZ820E is the best choice out of these two models. It’s dedicated to embroidering and has the larger work surface (5×7 compared to 4×4). It comes with a variety of hoops and other useful accessories so you can try it out before you run to the store for supplies. 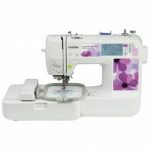 If you would like to be able to sew clothing and other home decorations as well as perform embroidery, the Brother LB6800PRW is the perfect solution for you. Although it has a smaller embroidery work space, it’s a very versatile and user-friendly machine. Click here to purchase Brother LB6800PRW on Amazon.com! Click here to purchase Brother Designio Series DZ820E on Amazon.com!